There’s a palpable sense of dread in the film’s 1986 prologue where a little girl wanders away from her parents at a Santa Cruz fun fair and has a harrowing experience in a house of mirrors. Later, as an adult, that same little girl finds herself back on that beach during a family vacation that leads to a home invasion by a red-suited, scissor-carrying family of shadows. Dopplegangers brood throughout Peele’s sophomore effort as a writer and director, and with a larger budget, he casts his net of ideas broader than he did in the succinctly satirical Get Out. 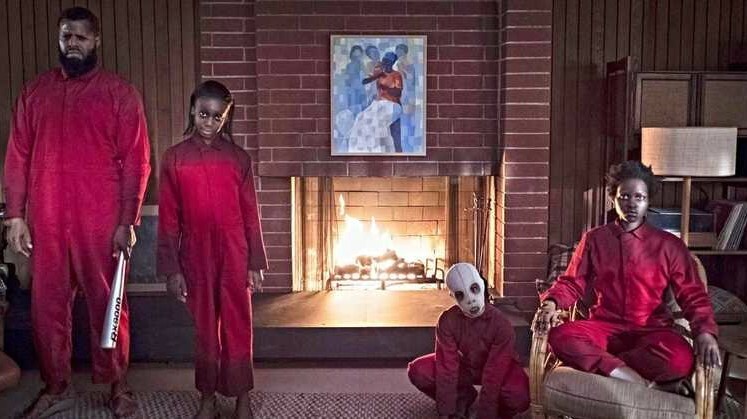 There’s a lot going on here, and Peele has clearly found his groove in setting a unique mood, cutting tension with his now signature sense of humor, and then going all out in turning modern horror film tropes on their head. Bunnies and beaches, social commentary and mass killings, ballet and butchery…it’s all on the table, and it’s gripping, fascinating and sometimes confounding. Peele leaves no horror cliché unturned, including the twist ending, which I assumed during the first sand-tray therapy scene. In lesser hands, it could have become a bloody mess, but Peele shows complete control of his runaway train wreck. Peele’s cast is more than up to the task of carrying the audience along through his fun house of horrors. In the lead role, Lupita Nyong’o gives one of the all-time great horror performances. She’s so good, I’m not even sure I fully comprehended how good she was yet. As her husband, Winston Duke provides most of the comic relief without ever coming across as annoying, and he’s clearly a stand-in for Peele. As their children, Shahadi Wright Joseph and Evan Alex are real, sympathetic, and resourceful. As the African-American family’s crassly rich Caucasian friends, Elizabeth Moss and Tim Heidecker (who, like Peele, comes from a similarly absurdist comedy background) are spot-on and comically unnerving. All take great glee in playing their own shadows. And then there’s that score from Michel Abels that has a chance to become as iconic as Goblin’s Suspiria theme. It gets under your skin with nightmarish efficiency and is married perfectly to Peele’s expertly rising tension. I’m still not fully sure what Us was all about it, but I’ll be damned if it wasn’t wildly entertaining on every conceivable level in spite of that messy denouement and telegraphed-too-early twist. “Who are you?” Lupita Nyong’o asks her terrifying shadow. “We’re Americans,” the shadow replies. I can imagine film students debating what that means for decades to come. And if we’re lucky, Peele will be leaving audiences hair-raised and making us think twice about why we’re scared of what we’re scared of for the rest of his career. This entry was posted in Movie Reviews, Movies, Pop Culture, Psychology and tagged Dopplegangers, Elizabeth Moss, Evan Alex, Hands Across America, Home Invasion, Horror, House of Mirrors, Jordan Peele, Lupita Nyong'o, Michael Abels, Shahadi Wright Joseph, Social Commentary, Tim Heidecker, Us, Winston Duke. ← Is this Hell in Transit? I don’t know. I just saw it, and I think the reason it’s hard to sort what it’s about is because it’s too messy and doesn’t deliver what it’s actually about. The sorry started to fall apart at the end of the first act when the shadowfolk held the family captive. It seems people are giving Peele way too much credit based on the wonderful genius of Get Out. When considering this on its own terms, the only thing that holds up are the performances (specifically Lupita). The character motivations were primarily survival once into the second act, but why the characters chose their actions didn’t come from character, it came from the writer. I initially thought this was a story about class. I thought that the shadow version had replaced the original Lupita in Santa Cruz, and then was fighting to maintain her stolen spot in “American” society. But it just doesn’t hold up. By the time the telegraphed “twist” is shown, it is irrelevant. It wasn’t even entertaining. After the midpoint, I kept thinking, “where is this going? Is it over?” This is definitely a great idea that I think might have gone better after sitting for a while and getting developed around a better story. I can understand your viewpoint. The second half of the film was messy… but I think it was intentional. The funny thing is I’m not sure what the intention was. You could end up being right, but there was something Peele was trying to say with the messiness…the whole “statement” of the Hands Across America. I need to marinate it on more. Maybe he was just saying America is a mess…we are a mess. Very true! The Hands Across America emphasis does complicate it. I guess the implication is either that these clones got the part of the soul that is capable of actually striving towards unity–or–that it is only an innocent child who would believe that that many people could join in a physical display of harmony, and that the display would actually fix anything. I think that’s what you’re hinting at in your introduction, and I like that reading of the ending. I just don’t know if I’m willing to give Peele as much credit based on one film. Maybe if it were more entertaining throughout. I just felt like I was anticipating greatness or even something above mediocrity that just wasn’t delivered. How did you feel in the moment when watching it? Did the individual scenes work for you? I was totally invested in it in the moment and fealt true dread (I credit some of that to the performances, but also Peele’s staging…also the music). The individual scenes did work for me for the most part – especially the stuff at Moss and Heidecker’s house. The only sequence that started to loose me was the whole ballet / face-off scene towards the end in the abandonded space beneath the house of mirrors.